Research by Dodge Data & Analytics has repeatedly demonstrated that use of BIM reduces rework, reduces RFIs and has a positive impact on project cost and schedule, especially when it facilitates the transfer of reliable project information between team members. Owners, GCs and trade contractors who use BIM or see BIM used on their projects were asked if they agree that the use of BIM decreases risk on projects. In general, over half of respondents agree that BIM reduces risk on their projects. However, approximately one quarter of owners and one third of contractors also remain neutral on the impact of BIM on risk. 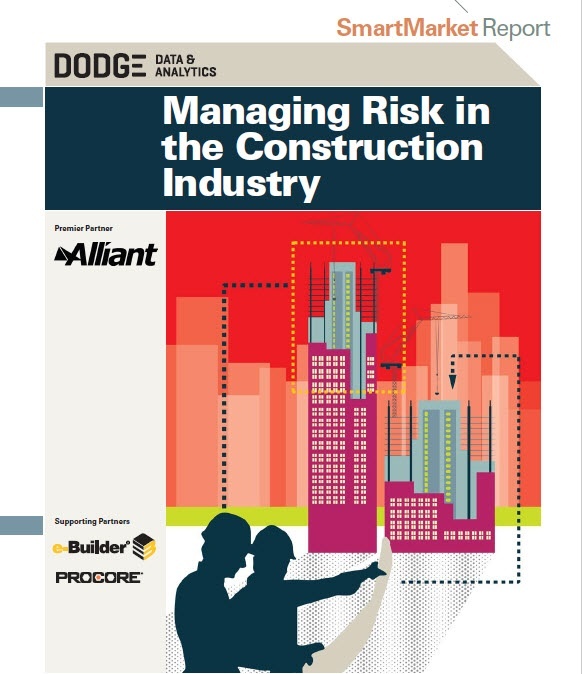 Owners currently are most likely to report that using BIM reduces risk. Two thirds of owners (67%) agree that BIM decreases risk on their projects, compared with 57% of GCs and 54% of trade contractors. Previous SmartMarket Reports have demonstrated owner condence in the impact of BIM on their projects, including the 2015 Measuring the Impact of BIM on Complex Buildings SmartMarket Report. A particular risk identified in the project analysis was the location of the architect and a number of the design team’s engineering consultants outside the region. To ensure this posed no disadvantage, Gilbane implemented a design assist strategy, retaining a structural and historical consultant in New York to enable all members of the design team to function as effectively as if they themselves worked in the city. Extensive use of BIM facilitated the team’s communication. Facility owners currently using BIM, plan to actively increase their use of BIM on more than three quarters of their projects over the next two years. BIM visualization to enable better understanding of design. Fewer problems during construction from deficient documents or coordination. More well-reasoned design due to BIM analysis and simulation. Beneficial impact on the project schedule. Excerpt: As owners expand their BIM involvement, there is a growing need for them to understand how best to enable their project teams to provide them with he greatest BIM value. In other words, what makes a good "BIM owner"? Several experienced AEC firms offer perspectives on that question. Excerpt: Owners who adopt BIM for facilities management are viewing numerous potential benefits, but they face a range of cultural and technological challenges along the way. In order to achieve integration, are pursuing a variety of these strategies. 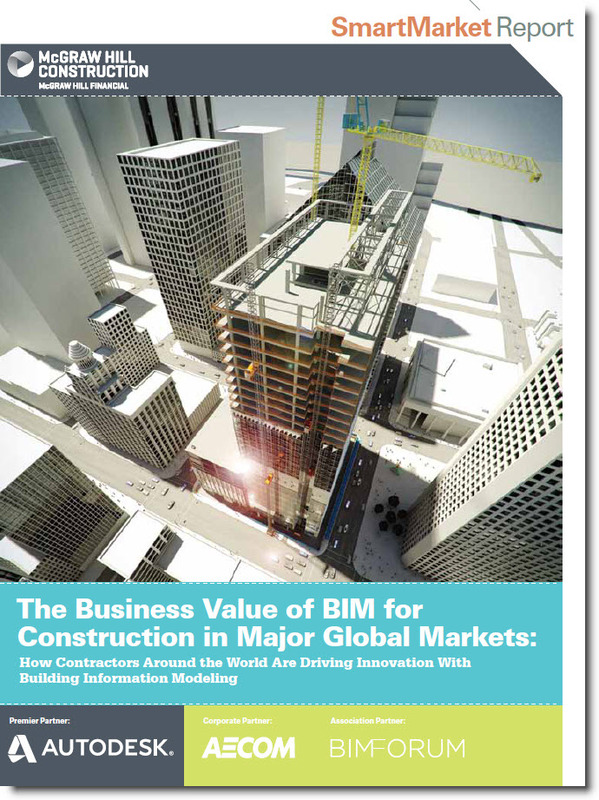 This sixty page report reveals the value contractors find in their use of BIM in nine of the largest global construction markets: Australia/New Zealand, Brazil, Canada, France, Germany, Japan, South Korea, U.S. and U.K. It offers insights, both overall and by market, into the profile of contractors using BIM, the benefits and ROI derived from their BIM investments and the critical activities and practices for which they are using BIM. Specific snapshots of the contractor responses by region also provide additional understanding of the current use and future potential of BIM globally. This link takes you to the McGraw-Hill site to obtain the free download thru their e-store. 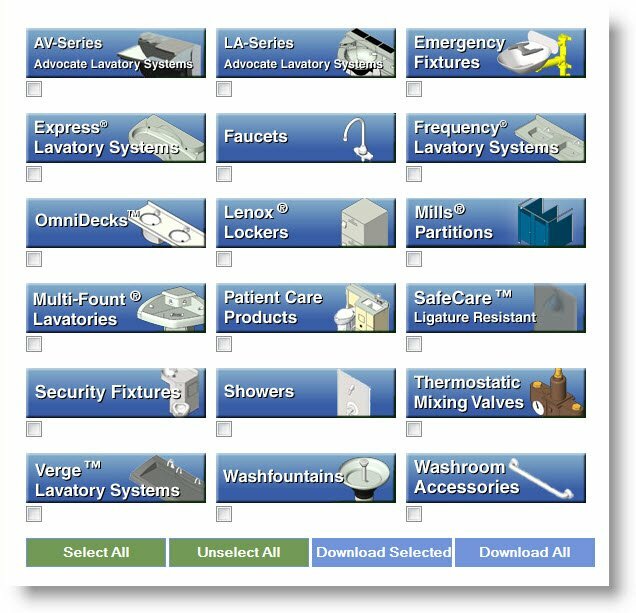 Recent (2013) and additional McGraw-Hill SmartMarket BIM Reports can be downloaded from the Bradley BIM Industry Links Page. 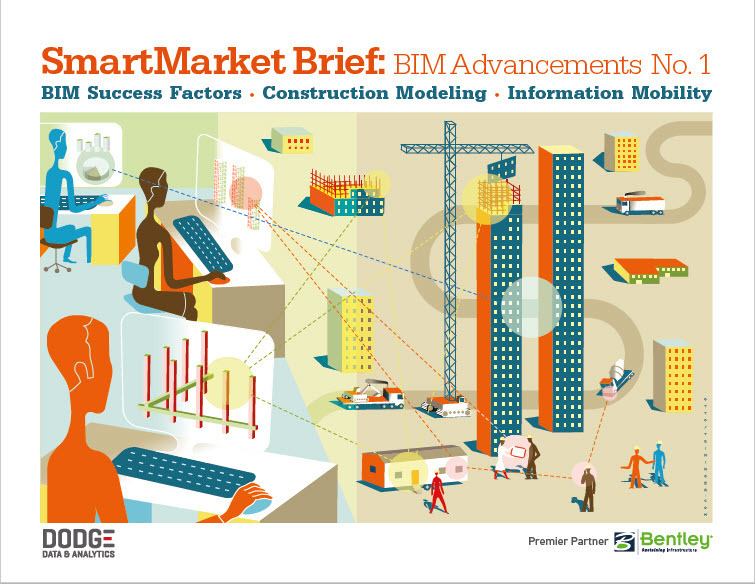 "Lean Construction" and "Information Mobility" SmartMarket BIM Reports were both released in 2013. 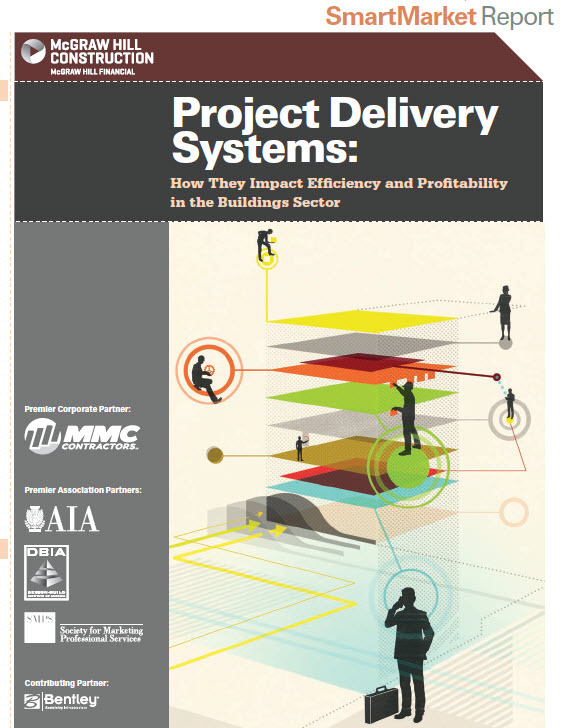 Design-Bid-Build: 38% of architects and 22% of contractors find this to be the best system to reduce project cost. 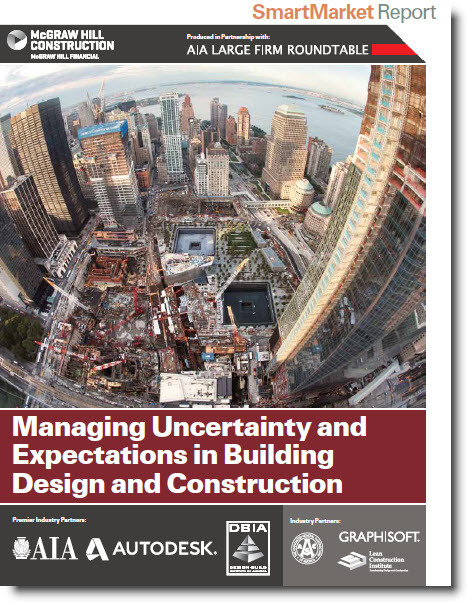 Design-Build: 43% of architects and 50% of contractors find this to be the best system to reduce project schedule, and a higher percentage of owners using this method report projects finishing ahead of schedule than with the other two systems. 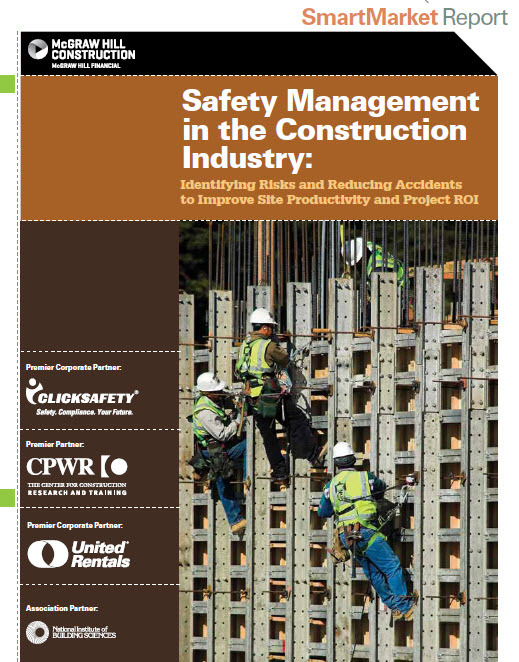 Construction Management at Risk: A higher percentage of owners doing projects that employ this system find that their projects that employ this system find that their projects are under budget(33%) and 60% report being very satisfied with the projects they have conducted, which is at least 20 percentage points higher than those using design-bid-build or design-build. BIM Report Contributors: 391 owners, architects, engineers and contractors indicated they had a moderate to high level knowledge on the use of BIM within their organization. However, by 2015, many companies have gained deep experience with the use of BIM. Therefore, we believe the time has come to take the critical next step in the research and to establish the specific level of impact BIM has on 10 types of design and construction activities. To do so, we asked respondents to quantify the positive impact of BIM for six specific metricsthat could be measured in terms of percentage of improvement. The research focuses specifically on complex projects because they offer the best opportunity to experience the powerful benefits BIM provides. 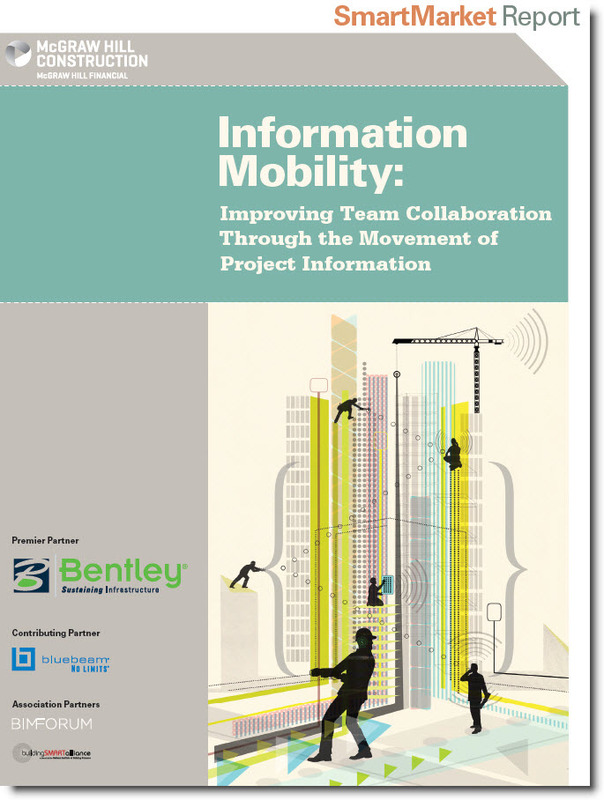 how information mobility is leveraged to improve efficiency and productivity. 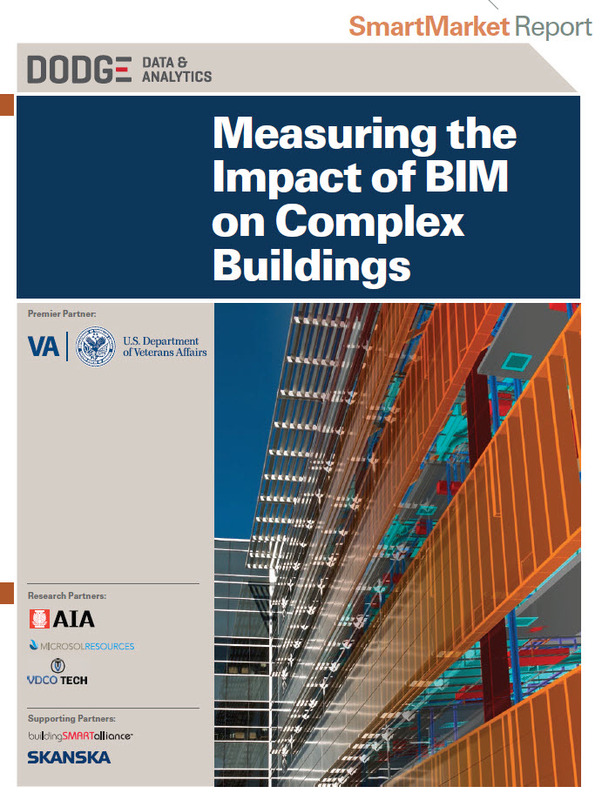 This research provides insight into the percentage impact of BIM on 6 key project outcome metrics, and the frequency and value of 10 project factors that influence success with BIM. It also identifies the frequency and negative impact of 6 obstacles to BIM effectiveness and the 4 most important success factors for BIM. This research provides insight into the frequency and value of seven types of 7 types of construction models produced by trade contractors, and 6 key uses for construction models on projects. It also identifies which parties are most frequently authoring construction models for specific uses. This portion of the study focuses on the developing practice of construction modeling, specifically by examining which types of contractors are producing models for what uses and how much value they are providing to improve project processes and outcomes. To achieve the full potential of the new technologies; it is critical to understand how effectively project information is flowing between project team partners, between the jobsite and main office and between systems within the company. The results of this MHC study of information mobility demonstrate the gains the industry has been making, but they also reveal the critical gaps that must be addressed to support the ongoing shift to a more collaborative approach that is currently taking hold in the industry. 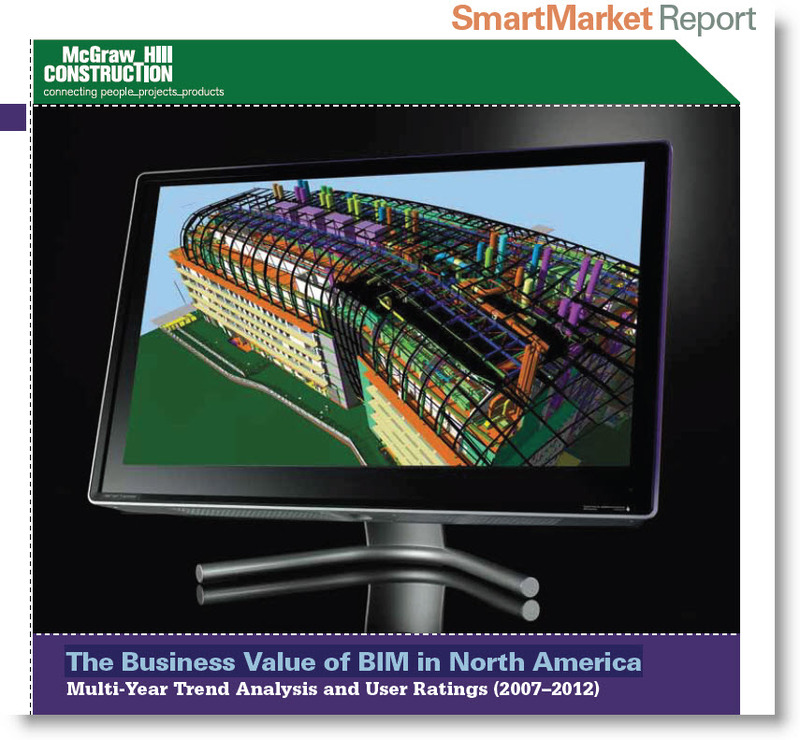 Download the 50-page 2013 McGraw-Hill Construction SmartMarket BIM Report: Information Mobility. The report provides graphs, charts, interviews and the popular business case studies from real project outcomes. 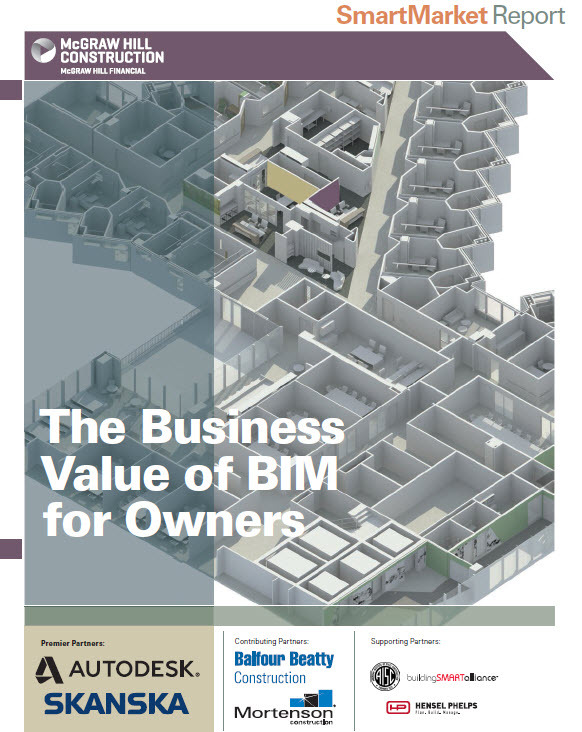 The Bradley Quarterly BIM Newsletter is now available online.